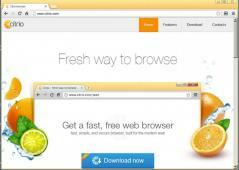 Citrio is a free web browser that offers a clean and fresh approach to navigating the Internet. All download can be managed from the related window, plus you can pause/resume items but also batch manage the recent downloads. What’s particularly interesting about Citrio, is it also bundles the capabilities of a torrent client, thus you can download torrent files without the need of a separate tool. Citrio also comes with built-in malware and phishing protection to keep your computer and privacy safe as you browse the web. It also lets you connect to the Internet via proxy servers offered right in Citrio’s interface. Since it remembers settings, you only have to configure the proxy server once. It also lets you test the speed of the proxy server you just set up, and ensure it is fast enough for your needs. Furthermore, Citrio can run either as a Modern Windows 8 app or as a traditional desktop program. It also speeds up downloads several times! Since I've downloaded Citrio 6 months ago, I've never even thought about going back to Chrome. Citrio is far more superior. Looks too much like Chrome. One of the browsers I use. This one mainly for downloading stuff.